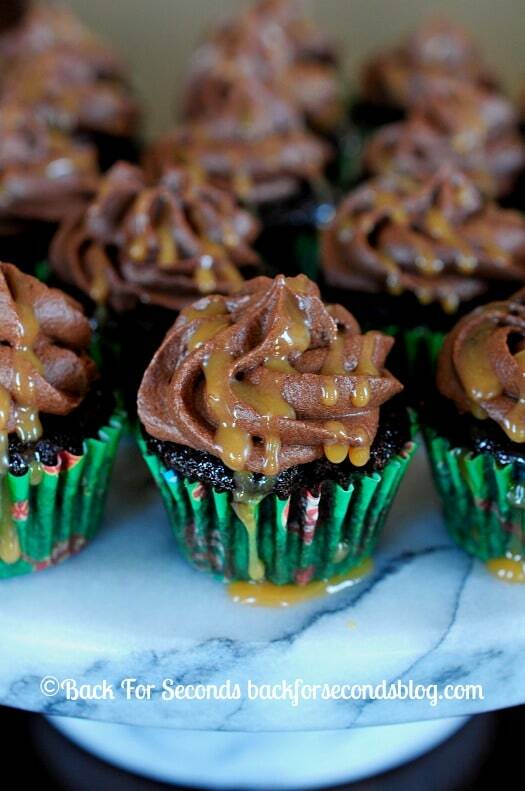 These homemade Salted Caramel Chocolate Cupcakes are so dreamy. Make these for your next party…or just your next cupcake craving! Never miss a recipe – follow Back For Seconds on Bloglovin’! A while ago I shared my recipe for a super easy caramel dip that is made with simple ingredients and NO candy thermometer. 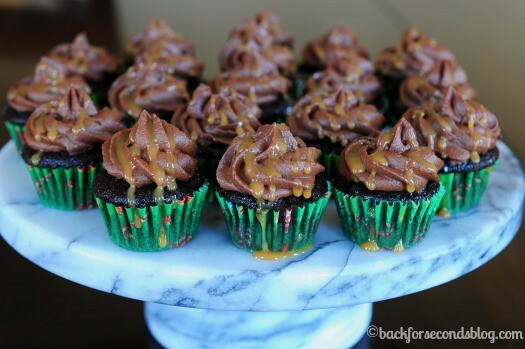 You can use that recipe for the caramel in these cupcakes and just use the rest for a yummy dip for apples and pretzels – or pour it over ice cream! 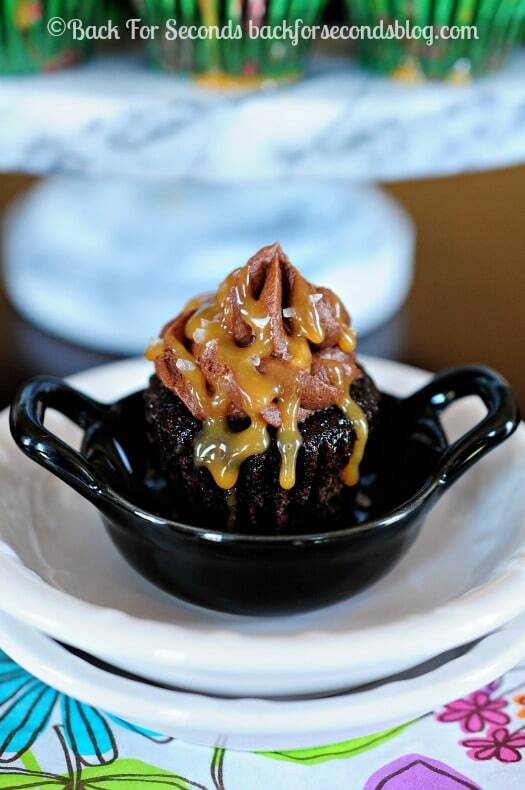 If you want to cut out that extra step, you can certainly use jarred caramel sauce and it will still be scrumptious! If you have never made cupcakes from scratch, it’s time to try! I promise it really isn’t hard at all! This is an easy recipe that looks and tastes impressive. The cake is light and moist and chocolatey, and the frosting is so creamy and smooth. The salted caramel balances out the sweetness perfectly, and the extra (optional) sea salt on to gives a nice little crunch and an extra salty kick. These are one of my favorite cupcakes, I hope you love them too! Brought these for a girlfriends birthday last night and they were a hit! I completely forgot to drizzle the caramel sauce (store bought) but they were plenty decadent without it! Thanks so much for sharing this fantastic recipe! YUM!! I do not do too many cake mixes from scratch but this one makes me want to try it! Those look like ooey gooey fabulous cupcakes! Can’t wait to try them! I want all of these! They look so perfectly moist. Yum! 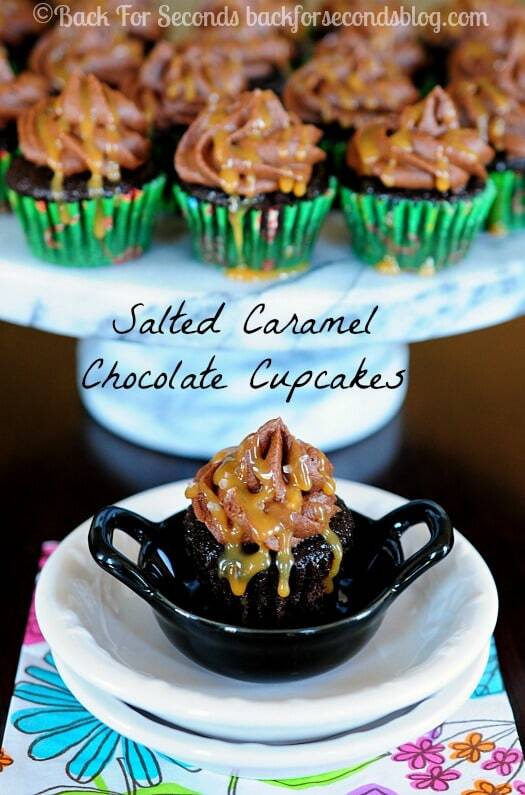 I’m all about salted caramel lately! These are so cute!